School officials confirm 22 students were stung by a swarm of bees outside Saginaw's Highland Middle School Tuesday morning during PE class. 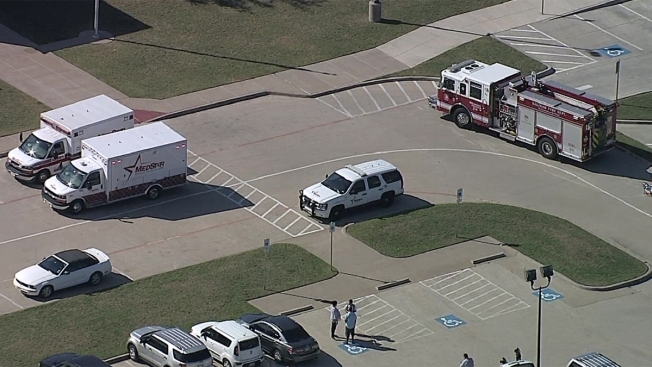 Eagle Mountain-Saginaw Independent School District spokeswoman Kristin Courtney said a group of sixth-grade students, 21 boys and four girls, were outside the school in the 1000 block of Bailey Boswell Road in Fort Worth when they were attacked while playing soccer. Courtney said the bees had built a hive inside an underground irrigation valve box, which was disturbed when one of the students stepped on the box cover. Officials told NBC 5 the 22 children were stung at least once, some as many as 12 times. MedStar officials said they transported four children to Cook Children's Medical Center, including one who had a severe reaction to the sting. All of those hospitalized were released Tuesday night. One student, Isaac Armendariz, was stung on the ear and his arm. "It was pretty weird. Just a whole bunch of people started running, chasing, the coaches were like, super calm and everything. They were trying to get us all situated and trying to get us away from the bee hive," Armendariz said. According to Courtney, the district's integrated pest management coordinator euthanized the remainder of the hive. Officials will continue to monitor the area for bees before declaring it safe for students. Animal control officers are awaiting tests on the bees to see if they were Africanized killer bees, but the pest management coordinator said that based on the bee's behavior they do not appear to be killer bees.